Here's a tag I've made for Hels Sunday Stamper challenge 194 with the theme of LIFE. It's been glorious these last few days so my thoughts turned to spring. It had to be bright colours so the background is Mustard Seed, Spiced Marmalade and Barn Door Distress Inks swooshed over clear embossed butterflies from TH's Fairytale Frenzy set. 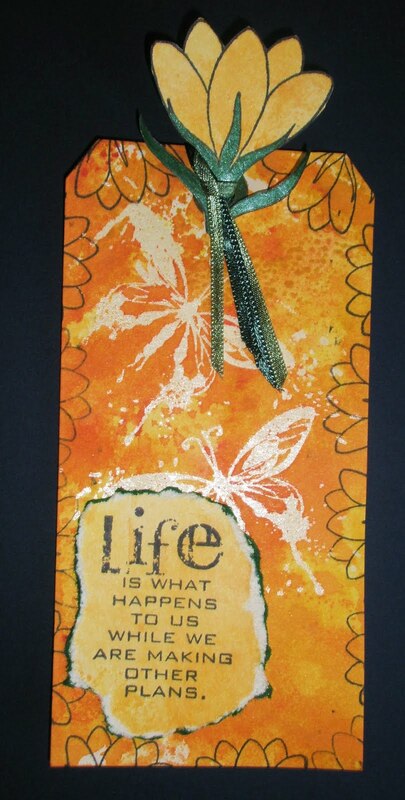 I then used a paler version for the stamping - the Life phrase from TH's Stuff to Say set and Crocus from Elusive Images/Chocolate Baroque. My crocus aren't doing too well this year but the snowdrops are still trying to flower. And the daffs are nearly out. All seem to be confused as to what they should be doing. Guess now they've announced a drought here in the south-east we'll get months of rain!! Oh well best enjoy the sunshine whilst we can!! A little worried about myself as liking the colours you have used and everyone knows I don't do orange, shows why it is good to challenge yourself. Great colours; love the crocus. What a super tag..love it! A ssmashing tag Elaine & I love that sentiment. Love the colours, very spring-like indeed! Warms the heart.